If you are a boat owner and relocating, you need to take your boat with you to the place you are going. Or if you are going for a vacation and want to go boating, you will also need boat transport. Boat Shipping is a specialized vehicle transport. Today it is a useful service available to all boat owners. You don’t have to haul your boat yourself. Instead, you can trust professionals with this task. Although, boat transport is not like any other type of vehicle shipping, there are auto transport companies that can help you with this responsible task. Boat Shipping is a thorough process. The important stages of this process are loading and unloading of the boat. If loading a regular car would take 10-15 minutes, loading the boat would take twice as much. Loading and unloading of a boat also take teamwork. That’s why not every vehicle transport provider can offer this kind of vehicle shipping service. But at Denver Car Shipping, we got it! 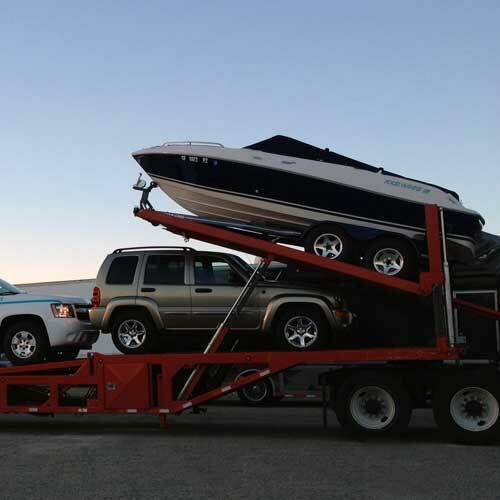 Our crew can perform Boat Shipping perfectly, just as the rest of our Denver Auto Transport services. We have all the required equipment and the paperwork to provide Boat Transport. With us, you can be sure your boat will be shipped professionally. We deliver door-to-door and provide shipping services all over the United States. Contact us to estimate the cost of your Boat Shipping. At Denver Car Shipping we offer free quotes that are never final – there is always a chance that the price will go lower. Our goal is to beat other haulers’ prices while still providing exceptional quality Denver Vehicle Transport. We also have special discounts for our Boat Transport and other Denver Car Transport services. Denver Car Shipping will be happy to assist you with moving your boat!